Sulla asked Julius to divorce Cornelia however; he did not and instead joined army to escape the punishment of death. He returned back around 78 BCE after Sulla died. Sicilian pirates kidnapped him. Caesar did not take well when pirates demanded 20 talents of gold. He asked them to at least demand 50 talents and 20 talents was too less for his exchange. When Caesar’s companions got 50 talents of gold, Caesar paid to pirates and told he will have to come back to kill them which he did subsequently after returning to Rome. He hunted them down and crucified each of them. 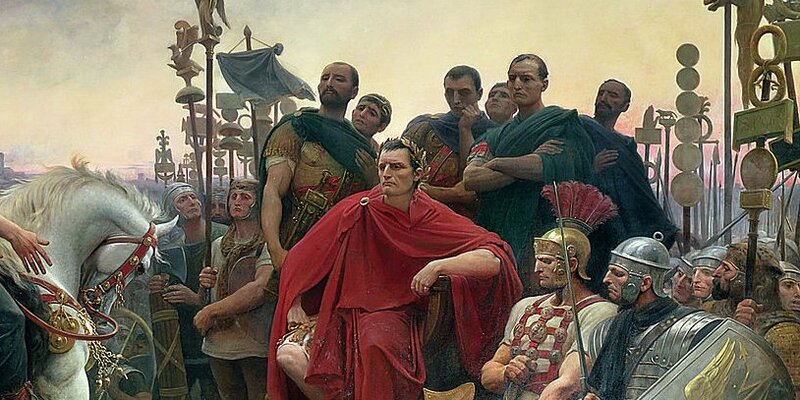 Caesar was well known for his war tactics and meticulous planning. Roman republic reached its full glory when Caesar was in command of the army. They had grown twice in size. Caesar was ruthless in battles. Chopping off hands, crucifying, dehydrating enemies were some of regular things Caesar used to do. He became Consul in 59 BCE with the help of Crassus who helped him financially and general Pompey. Just 1 year after Caesar became consul, Crassus died and Pompey was elected consul in absence of Caesar who was waging battles with the enemies. Pompey hatched plan to take Caesar out by commanding him to return. However, Caesar had enough army units to command and befriend. He returned with 13th legion back to Rome while Pompey ran out of Rome to save himself. By 48 BCE, Caesar was in total command of Roman affairs. Pharaoh Ptolemy and his agents killed Pompey in Egypt. Caesar went to Egypt and fell in love with Ptolemy’s sister, Cleopatra who was engaged in bitter succession battle with her brother. Caesar helped Cleopatra to come to power in Egypt and married her. He returned back to Rome after and was elected consul and dictator of Rome. He worked on key reforms for Rome including drafting calendar that we use today! On the Ides of March (15 march), 44 BCE, Julius Caesar was mercilessly stabbed 23 times in the senate-by-senate members who colluded to have him killed, as he was getting too autocratic. With him, fell the Roman republic and gave rise to Roman Empire. Caesar will go down in history as someone who had done good as well as bad things. A sort of grey character, which we seldom find in history but he had a magnificent tenure and easily will go down in history as 1 of the best. Previous Antimatter, What and How much can I buy for?